In this seminar, you will explore the powerful language of the unconscious and how it manifests in our daily life through symbolisms, language, dreams and rituals. The amazing work done by semiologists, linguistics, psychologists, through the expression of surrealistic art, give us the tools to understand how to access and decode our own internal universe of meaning. During centuries, human kind has been triggered by very deep questions about the meaning of life. In this seminar you will receive a very specific language to understand the deepest meaning of your life, how to embrace it, and how to communicate and share it with others. The basic tools you will receive in this journey are the collective and group support for performing psycho-shamanic acts inspired from the work of Alejandro Jodorowsky, and the semiologists that precede him. Psicomagia is a way to heal the soul not through the use of words, but acts, images and symbolisms that work directly with our unconscious. It is a combination of psychotherapy according to Carl Jung, shamanism, systemic constellations according to Bert Hellinger and magic- the power of intention. Psicomagia is the art of accessing the power of ourselves through elaborate meaning of our life, through the use of rituals and theatrical acts. The core concept of Psicomagia is that any ritual performed will affect our internal universe, regardless of the possible effect in the external universe. By reordering firstly our internal world in the five basic levels of consciousness (sexual-physical-emotional-mental-spiritual) , the shift can potentially manifest, or not, in the outer world. The scientific background of this art is based on the fractal understanding of the universe, from Nassim Haramein and Dan Winter, the morphogenetic field resonance of Rupert Sheldrake, the Epigenetics of Bruce Lipton, where all of them basically conclude that it is the reflection as in a mirror of human emotions, intentions, and thoughts that can potentially affect our internal and external world. Another tool you be able to use is the proper reading of the 22 archetypes of the old tradition of the original Tarot de Marseille. The archetypes are considered the foundation of the subconscious. They are very powerful figures with a dense metaphoric meaning that will give you the tools to decode yourself, your dreams, your subconscious and help you to transcend the world of duality. They represent a cosmology, a unified vision of the physical and the spiritual that can help you to know yourself. Alejandro Jodorowsky is a French-Chilean surrealist artist, philosopher, mystic, filmmaker, poet, actor, psychologist and book author who has incorporated in his work teachings of Zen, Taoism, Sufism, Yoga, Carl Jung, George Gurdjieff and others. Jodorowsky reconstructed the original form of the Tarot de Marseille. From this work he moved into more therapeutic work in three areas: psychomagic, psychogenealogy and initiatic massage. Psychomagic aims to heal psychological wounds suffered in lifethrough the performance of shamanic acts that can directly act upon the unconscious mind, releasing it from a series of traumas, that can be passed down from generation to generation. Psychogenealogy includes the studying of the patient’s personality and family tree in order to best address their specific sources. His best movies include The Holy Mountain, El Topo, Fando and Liz, Santa Sangre, Poesia Sin Fin, The Dance of Reality. 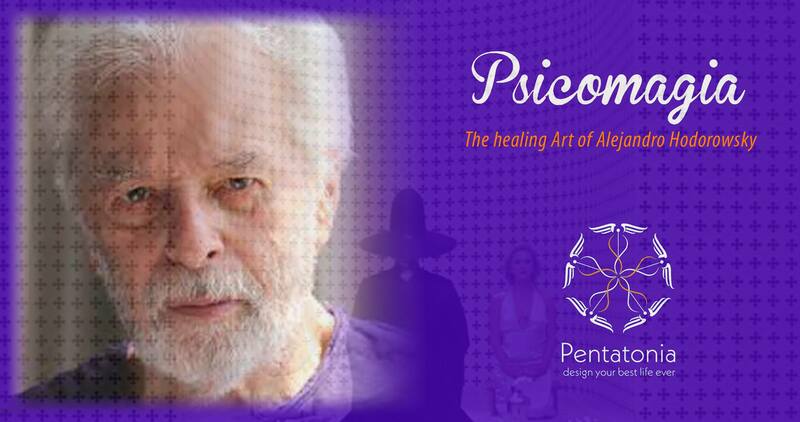 He is the author of Psicomagia, The Dance of Reality, Manual of Psychomagic: The Practice of Shamanic Psychotherapy , Metagenealogy: Self-Discovery through Psychomagic and the Family Tree Paperback, The way of the Tarot, Gospels to Heal. Arturo Ponce de León is from Mexico, a Psychologist and Holistic Coach, incorporating breathing, physical exercise techniques, yoga, transpersonal psychotherapy and systemic constellation, psychomagic acts, semiology, enneagram teaching,geometric visualizations, and tantric practices. He has been studying Jodorowsky’s work for over 14 years. Lydía Isabel de León is a Greek Holistic Coach and Wellness Mentor, incorporating nutrition, supplement/herbs/superfoods, biohacking, non-violent communications, emotional healing, biogeometry, mudras, tapping, spiritual awakening, meditation and sacred sexuality. She has been studying systemic constellations, Jodorowsky’s work and art for healing the unconscious .